Measures needed to prevent environmental disaster = too many, too late? Part 2 of the series discusses water scarcity and focuses on my former haunt of Shijiazhuang. I can definitely confirm that it was dry, dry, dry there. The DH says that from the air, the whole area looked like desert to him. I was very glad to leave Shijiazhuang for the relatively clean air of Linyi. I hope it stays that way. A side note: New York Times has done away with that silly “Select” program, and now all content, including opinions, is once again available free of charge. Okay, I have to know. Is the entire world being bombarded with Bruce Lee’s sage advice to just “Be Water, My Friend” or is it just Spain? BMW recently released a commercial featuring an interview with deceased martial arts star Bruce Lee in which he tells the camera to “be like water” in a really intense way. He speaks in English with Spanish subtitles. The effects of this commercial are being heard everywhere, because everywhere I go I hear everyone saying, in English, “Be water, my friend.” I loved the commercial the first few times I saw it. I still do, actually, I think it is a great commercial. But the novelty of “Be water, my friend” is wearing thin. The commercial ends with BMW telling us not to adapt to the road, but to be the road. Okay, I have to complain. I just went to the ESPN website to see what they had to say about the F1 race. First of all, it was virtually impossible for me to locate the link that led to ONE story about the race. Then I read the story. HORRIBLE! Who is this writer? They made all sorts of mistakes in their reporting. Fact-checking, please! 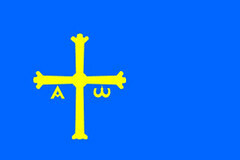 Blue and yellow are the colors of ASTURIAS! Again, fact-checking please! Why would Alonso wave a Brazilian flag!? Nonsense! It was Felipe Massa who was waving the flag, deliriously happy with his victory. Although, those are the comments of Alonso . Associated Press – Let’s see if you can get your act together! A Great Day for Spain! Brazilian racer Felipe Massa won the race, but Fernando Alonso is world champion for the second year in a row! And he is only 24!! Spain is a crazy country tonight because right after the F1 race finished, one of the biggest soccer/football matches of the year started – Real Madrid versus Barcelona. Real Madrid won 2 to 0. Again, I am not a huge sports fan, but it is a lot of fun to experience a football match in a crowded pub in Spain! Posted in Expat Life, Spain | Comments Off on A Great Day for Spain! I don’t know if any of you have been following F1 racing. I am not a huge sports fan, in fact, I don’t even watch the Superbowl. (I know, I’m a very bad American.) I have been following F1 racing lately, though, because the current world champion, (and soon to be for a second year), Fernando Alonso, is from Asturias. You can hardly go anywhere without seeing his photo or seeing his face in a TV commercial. 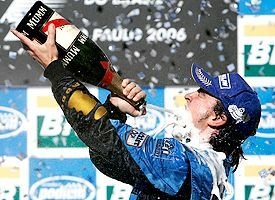 Today is the 2006 Brazilian Grand Prix in Sao Paolo. It is the last race of the season. For those of you who know very little about F1, the world leader for many years has been the German Michael Schumacher. This year Schumacher is retiring. He and Alonso are very close in their pointage and the Brazilian race will decide who will be the world champion. 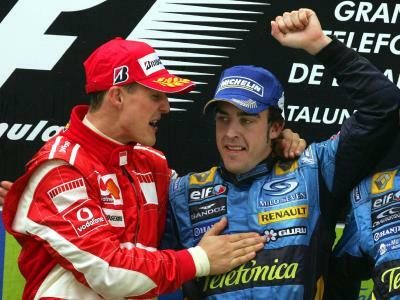 Of course, Schumacher would like to have the championship for his retirement, but it doesn’t look likely. If Alonso finishes within the first 8 spots, he will be the champion. So even thought sports isn’t my thing, I’m excited about this race. Everyone in Spain will be watching this evening as the home town hero wins again! Alonso started out racing karts at a very young age – something like 5 or less years! 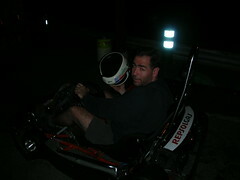 Last week, the DH and I and a few friends went to the kart track where Alonso raced as a youngster. 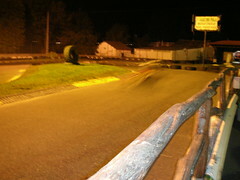 Right now they are not renting karts because they are building a brand new track. 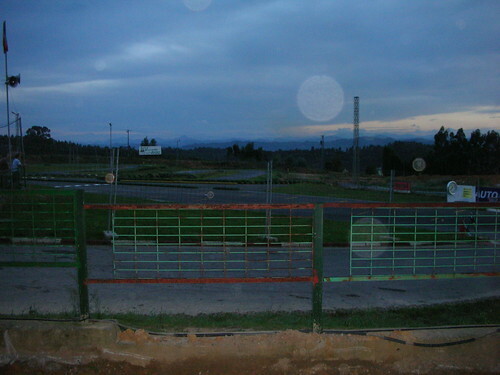 So we drove a little further away to Pola de Siero to another kart track. (Who knew they were so popular?) There the DH and a friend got to take an 8 minute ride around the track. The race starts in a few hours… I’ll post the results later this evening! 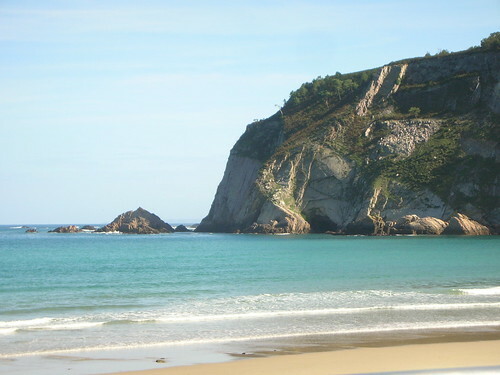 The world spotlight is on our very own Asturias right now. Have you heard? Tonight the Prince of Spain, Felipe, is handing out the prestigious Prince of Asturias Awards. What are the awards? You have heard of the Nobel prizes, right? Well, I think they are something like that. “The Prince of Asturias Awards are intended to acknowledge scientific, technical, cultural, social and humanitarian work carried out internationally by individuals, groups or organizations in the following eight categories: communication and humanities, social sciences, arts, letters, scientific and technical research, international cooperation, concord and sports. Nominees for any of the Awards must be outstandingly exemplary and their work or contribution to society must be of acknowledged international standing. Communication and humanities – The National Geographic Society! I think this is genius! Everyone loves the Ntl. Geo Society! They have been recognized for their efforts to educate the world on geography and the need to protect the earth’s precious resources as well as their support for scientific research and expeditions. Social sciences – Mary Robinson, former President of Ireland and UN High Commisioner on Human Rights, she is now head of the Ethical Globalization Initiative, which lobbies governments to honor their commitments to major human and civil rights laws they may have signed. Arts – Pedro Almodovar, Spanish filmmaker known for somewhat controversial, but always interesting films like “All About My Mother,” “Bad Education,” and Spain’s Academy Award selection for this year, “Volver.” He is part of a group of artists of the “transition,” who gained fame during the years of increased freedom following the death of dictator Francisco Franco. Letters – Paul Auster, American writer, poet and scriptwriter. Perhaps best known for his “New York Trilogy,” he is widely published and praised by critics. His most recent work is “Brooklyn Follies.” He is very popular in Spain, but I have to admit that as much as I love books and literature, I haven’t read his work. 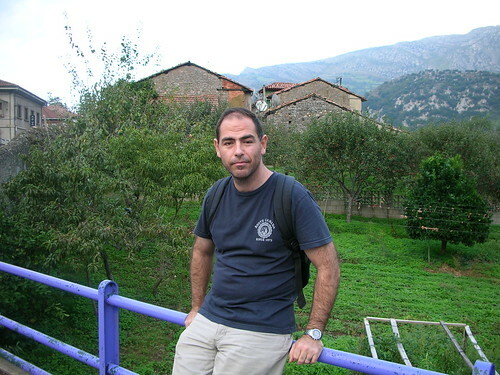 Scientific and Technical Research – Juan Ignacio Cirac, a Spanish researcher in Quantum Information Theory, working in the USA and Austria. International Cooperation – The Bill and Melinda Gates Foundation, which is dedicated to achieving equitable access to health care and education worldwide by supporting numerous projects in over one hundred countries. Concord – UNICEF, an agency of the UN that addresses the long-term needs of women and children in developing countries throughout the world. Sports – In a somewhat nationalistic move – Spain’s 2006 National Basketball Team, They have been recognized for defeating all odds and winning the 2006 World Champioinship title, the first for Spain since 1982. Winners receive a statue and 50,000 Euros. 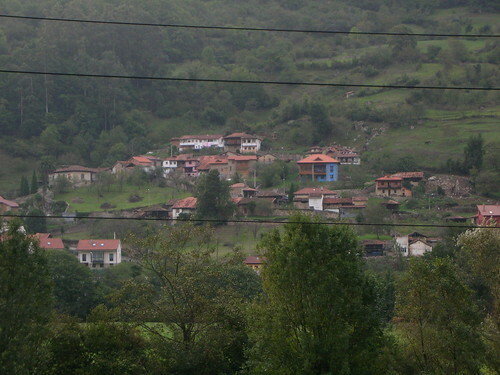 The ceremony takes place in Oviedo, which is the capital city 30 km from where I live. The city is one of the most beautiful in Spain, in my opinion. All of the award winners are there now, exploring the city, speaking with the press and preparing for the ceremony tonight. Everyone except for Bill Gates, who sent his parents to accept the award. I wish I could be there to see the presentations, but I’ll have to settle for Asturias Public Television as the city is choked full of people. A tropical beach? Thailand? Malaysia? Hawaii? No! I am still in Spain! 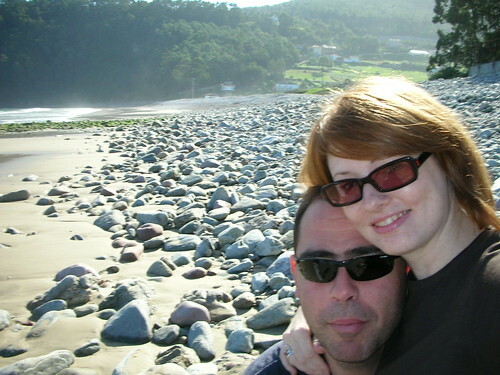 This photo was taken at Playa Concha de Artedo in La Muños, Asturias, Spain. 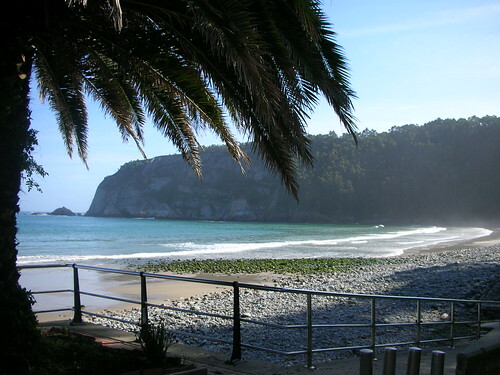 Palm trees are very common here, even in the north of Spain. In fact, a palm tree planted in front of a large house used to signify that the owner was a returned immigrant to the new world – Mexico, Cuba, Venezuela. Their homes are called Casa de Indianos, since they have returned from the Indies. 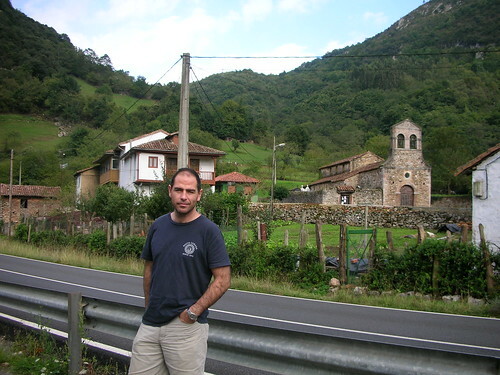 In the 19th and 20th century, many Asturians immigrated to the Americas to make their fortunes. 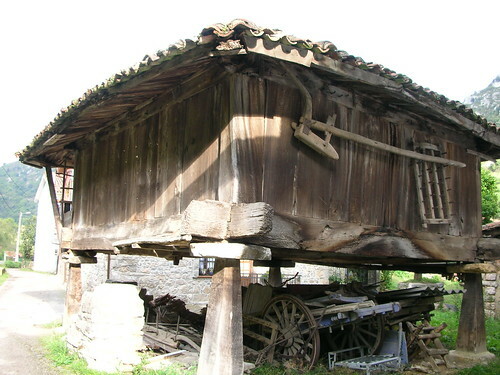 Many have never returned, but in these countries you will find Asturian cultural associations, since many families have retained some of the Asturian culture. The beach is beautiful and calm, very relaxing. The rocks are good, too, because sometimes you get tired of sand. 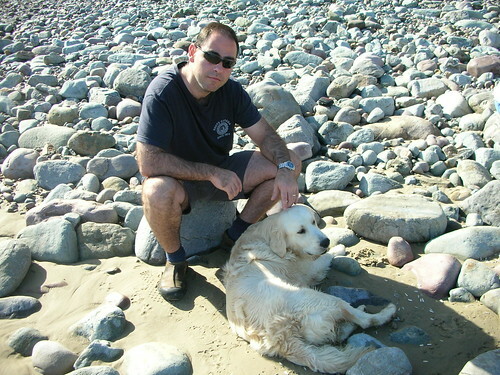 Here is the DH with a dog that just sort of adopted us. These pictures were taken during a brief holiday spent with friends at this beach. Spain was celebrating October 12th – the “Dia de la hispanidad” or Spanishness Day, also known as the saint day of Pilar. In America you know this day as Colombus Day. This day is also my “Suegro” or (father-in-law’s) birthday. The holiday fell on a Thursday, so many people will also take off the Friday so they end up with a 4 day weekend. This is called a “puente” in Spanish, which literally means bridge. I tell you, these Spaniards know how to live! 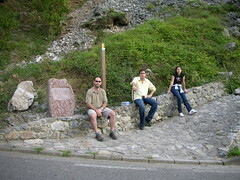 Last weekend DH, our friend F, and my sis-in-law hiked up a mountain for the sole purpose of eating. Let me explain. 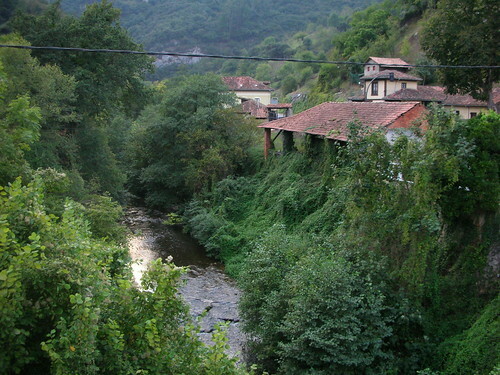 A few blogs ago, I mentioned the “Xanas,” Asturias’ version of sirens. 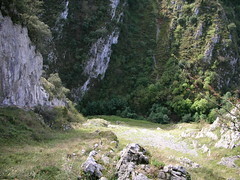 One of Asturias’ very well developed walking trails is called “El Desfiladero de Las Xanas,” or “The Xanas’ Trail or Canyon.” It is typically described as being short, easy, and with a really great restaurant at the top. In fact, if you mention that you recently walked the Xanas, or you are thinking about doing the Xanas, the only sort of reaction you will get is: “Did you eat at the top?” or “Are you going to eat at the top?” This place is legendary. 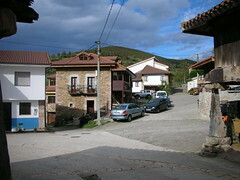 The route starts in the village of Villanueva, which I already mentioned to you in a previous blog. 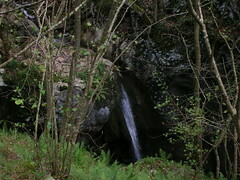 There it is, from the beginning of the trail. 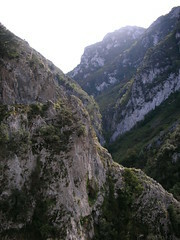 But to most people, this canyon will seem quite impressive. 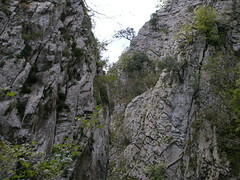 The trail follows the left-hand side and is, for the most part, carved out of the walls. There are few harrowing moments to be had crossing over rock slides, where you are certain that one misstep will send you barreling down to the “river” (again, for you Utah readers, creek). But all-in-all it is fairly easy and safe, as evidenced by all the 7 and 8 year-olds jogging along the trail. About half way to 2/3rds up, the trail enters a forest. (Bosque in Spanish – I love this word! Bos-kay) Sounds enchanting. 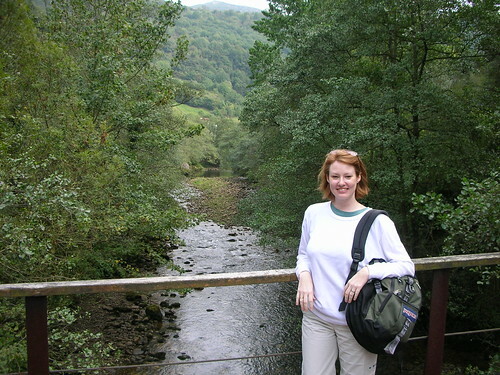 I was all ready to be charmed by the Spanish Bosque, full of sprites and elves and xanas! But no, although extremely scenic and very beautiful, it was mostly just full of mud! (It rained the day before so it was slippy-slidey.) BTW, they call it Barro in Spanish which I much prefer to mud. Actually, barro might just refer to clay-like mud, but you know, sometimes details get lost in translation. Perhaps this is the hiding place of the so-called Xanas? They love mountain streams. You’ve arrived “at the top” once you emerge into a glorious green meadow, full of grazing cattle and picturesque wildflowers, you know, straight out of “The Sound of Music.” Ordinarily, that would have happened, but we sort of got lost, and followed a fork in the trail that turned out to be perfectly fine, just longer. So we didn’t get that “The Hills Are Alive…” moment, but we also didn’t have to ascend said meadow, which must be at an angle of about 80 degrees. The restaurant is called Casa Generosa, and generous it is. 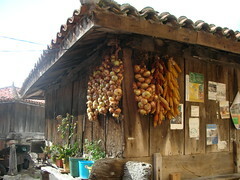 The food is typical Asturian, and there is not a lot of choice. Not that you need it. The choice has already been made for you – the good choice. In Spain, a meal is generally made up of courses. Europeans do not fill their plate up with a main dish and sides, like we do in America and Canada. For our first course, we had a choice of either Fabada or Pote Asturiano. Fabada is the regional dish made up of big, buttery, bursting-with-flavor white beans, (called Fabes here, and no, they have nothing to do with Fava beans.). They also throw in a piece of chorizo sausage, a piece of morcilla sausage (blood sausage – so barbaric but so good), and a piece of – how should I put this so a North American palate can appreciate it – fat, or bacon fat if you will. 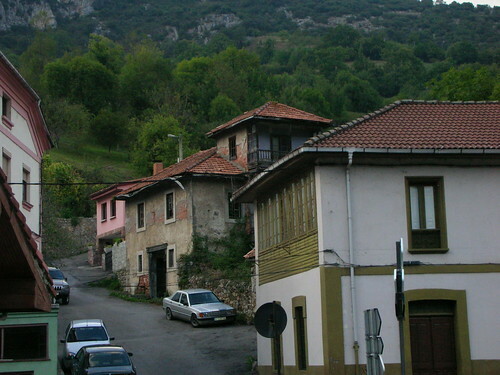 Pote Asturiano is also a major regional dish, also a stew. It might have a few fabes in it, but mostly it is vegetables, like potatoes and greens, with some chorizo and morcilla. This was my first time eating Pote, and I’m hooked. Actually, I had a bit of a food block against Pote, because I had mistakenly thought of the Spanish word Pota everytime I saw Pote. (Pota means vomit.) Believe you me, that was no Asturian vomit that I ate! L – Myself and our friend F. along with a bowl of Fabada. R – The restaurant, flanked by horreos. 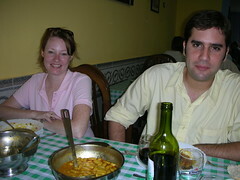 For our second course, we had cabrito and tenera – that is goat and veal – that had been stewed. Yes, I recognize that stewed goat is probably only going to sound good if you are from the Caribbean or Albania, but again, another awesome choice. L – DH & I deliriously happy post-meal. R – Close up on the horreo, with dried onions & corn. You know the drill after eating lunch in Spain – Siesta. Sleep. Nap. Anything but an hour and a half descent down a windy, narrow mountain path. Did I regret the goat and beans? 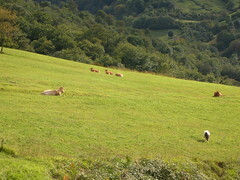 No, don’t worry, common sense won out, and a modified rest/siesta in the mountain meadow, among the cows, allowed us to digest just enough. 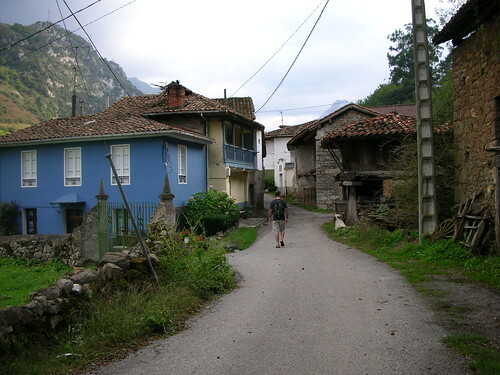 This reminded me of the time, 5 years ago, when the DH and I went hiking in Western Asturias, in a fabulous place called Taramundi. 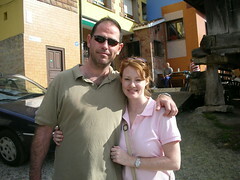 We had spent the whole morning hiking when we stumbled upon a restaurant. They pretty much only served Fabada, which was fine with us, because we love it. 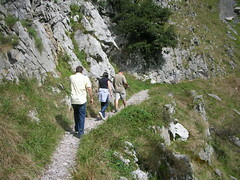 Well, after a long lunch eating a thick, heavy stew of beans and meat, the last thing you want to do is continue hiking. We did, however, set off on the trail, only to pass group after group of Spaniards who had just sort of crashed out along the sides of the trail. 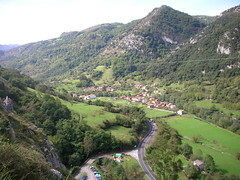 La Senda del Oso, or the Bear’s Path, is an easy walking and bicycling trail in the heart of Asturias. It was built over the remains of a railroad built to unite the mines in the mountains with the Arms factory in the city of Trubia. The arms factory is still in use, and no, they do not produce legs. Ha Ha. 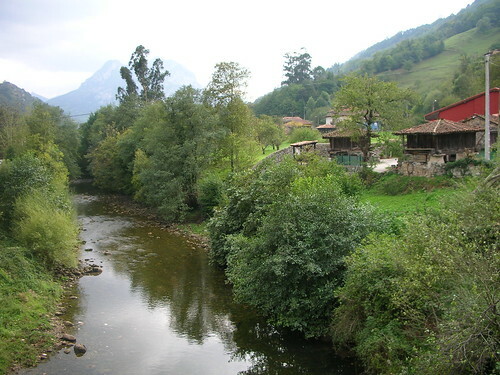 The route passes through typical Asturian villages and follows the Trubia River, which pleasantly gurgles and babbles along the trail. 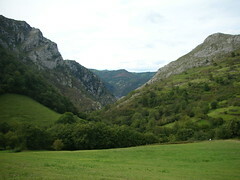 We walked the first stage of the trail, from Tunon to Proaza, about 14 kilometers round trip. 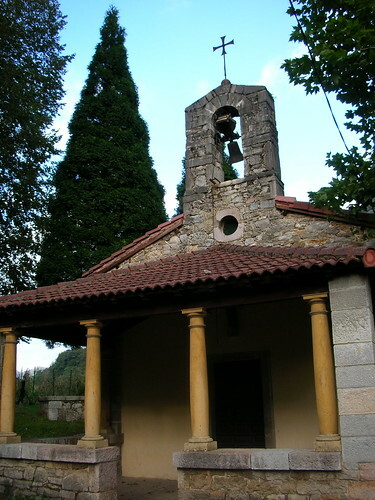 DH next to the Pre-Romanic church Santo Adriano. Here you can see my amazing photographic skills in action, with the telephone pole positioned in line with DH’s head. Several times along the trail we crossed over the river. 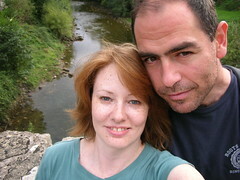 Here I am on one of the bridges. 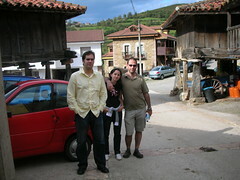 Villanueva is the first village that we entered. And another church, twelfth century. And of course, horreos. 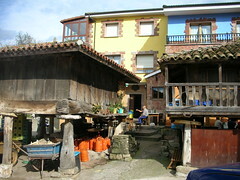 Horreos are traditional Asturian buildings where grain and food was stored. They are designed to prevent mice and animals from entering and destroying the stores of grain. 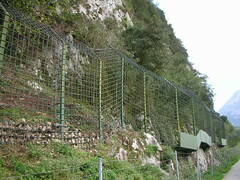 Further along the trail we passed an enclosed area where two Iberian bears live – Paca and Tola. We didn’t see the bears. Maybe that is because the day before one of them was naughty and injured the hand of a worker who approached the enclosure. 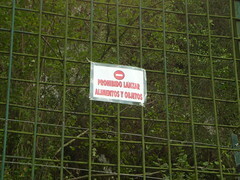 “Prohibido lanzar alimentos y objetos” Do not throw food or objects. 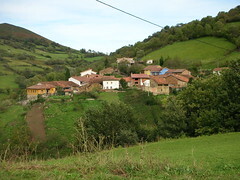 At the end of the first stage is the village of Proaza. 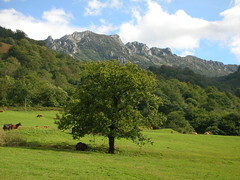 La Senda del Oso is just one of many trails found in Asturias.